Happy Wednesday (or happy new comics day, if you prefer)! Normally, I try to compose these updates outside of the Kickstarter interface, then copy-and-paste them in, but yesterday I was composing 1) in Kickstarter and 2) REALLY QUICKLY. Both were the result of the fact that we'd just ticked over the 100K mark, and I felt getting an update out promptly was important, but also because I had to pick up my daughter from school. Yesterday was her 10th birthday, there were Things Afoot to Celebrate, and I didn't want to be late. So I gave you the list of our gracious pin-up art contributors, and I was slapping the hyperlinks onto their names in a flurry, and I missed linking Kyle Latino's name and - just as importantly - his art. This is me rectifying that oversight! Kyle did what was the first-ever Lady Sabre piece not drawn by Rick. He did it within a week of our launch of the comic, almost two years ago, now. I was delighted beyond words when he sent it to us, not only because we'd inspired the art, but also because he'd so completely understood what we were going for. 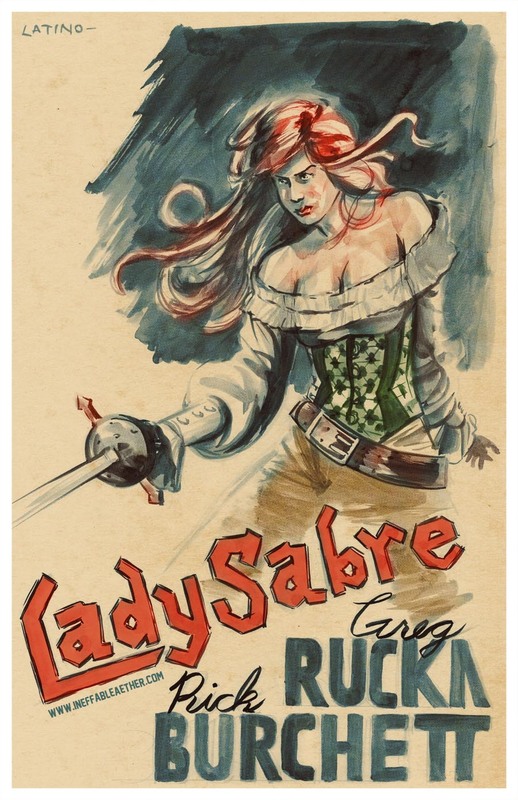 Lady Sabre as Errol Flynn? How could I not love that. This is the piece, and this is the piece that'll be included in the trade. My apologies to Kyle for the omission. Adrienne and Mick from Optimysticals emailed me yesterday with two of the prototype designs. I've added the images to the Kickstarter page, above the Pegasus patch, but instead of making you all scroll about, I'm including them here, as well. These are the prototypes, as I said, but I think they look terrific! It's always a huge thrill to get these emails. Very, very happy with how these are looking, and we hope you are, too! 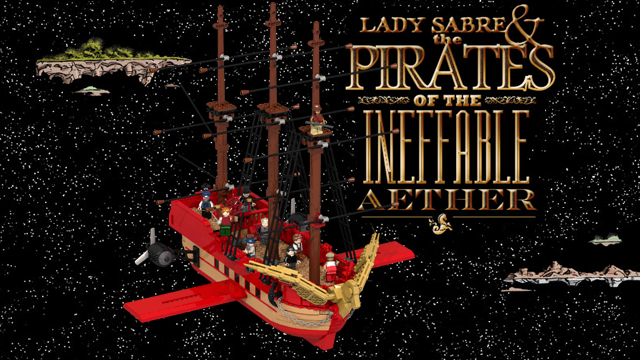 One of our backers, Glen Bricker, has undertaken to build Her Ladyship's conveyance, Pegasus, in those glorious blocks of imagination called LEGO. He's submitted his design at the LEGO Cuusoo site. The way LEGO Cuusoo works, people submit their LEGO designs for others to vote on as an indication of support. Once a project reaches 10,000 votes, it becomes part of a quarterly review by the folks at LEGO, who then will consider actually manufacturing the project. And here's a link to the page, if you'd like to vote. My dear friend (and new father! ), Neal Bailey, launched his own Kickstarter today, searching for backers to fund the printing of the second trade collection of his ongoing webcomic, Cura Te Ipsum. Neal is a machine, as is his collaborator, Dexter Wee. They've published consistently three times a week for over two and a half years, now, and they intend to keep at it until their story is finished. Cura is a smart, dark story that takes some very common sci-fi tropes (parallel dimensions and universes, etc) and gives them some very serious thought while at the same time exploring some frankly big ideas. It's dangerous, it's fun, it is - at times - blackly humorous. With Neal, you get what you see; he and Dexter have everything completed to deliver this trade set except the funds to actually print the darn thing. Neal set his goal pretty low, honestly. I'd love to see this campaign not only succeed, but succeed strong. Please give him a look, and, as always, consider backing his project. Kyle Latino's pin-up is slammin'! It is grace to the Young Protectors Kickstarter project that discovered your Magnificent Lady Sabre. And grace to your mention of Cura Te Ipsum, I anew discovered an interesting and original webcomic. Your project updates are the best. It's so great that you're using the updates, not only to let people know what's going on with this project, but also to clue people in on other cool Kickstarter projects. Love the comic. Love your work. Love the use of Kickstarter. Awesome! Keep it up!